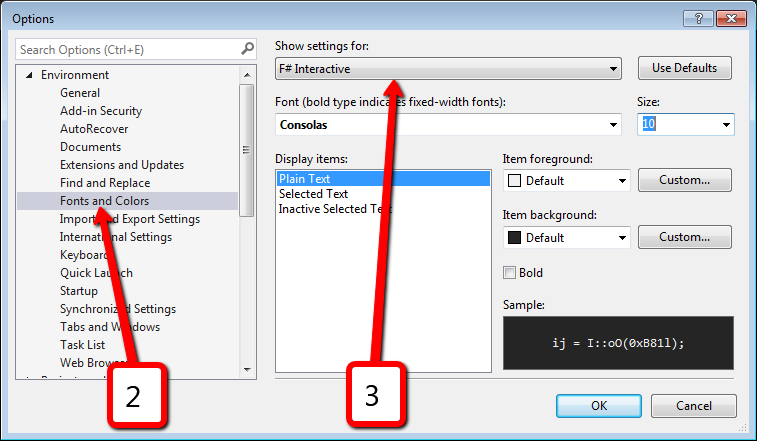 Select Environment -> Fonts and Colors. In the ‘Show setting for‘ drop-down select ‘F# Interactive‘. Here it is – you can change whatever you want. It’s time to make first steps to the new improved FSI. I feel that I should start looking for ways to implement something from My wish list for FSI. Let’s begin from #3 and try to find a list of declared variables and functions. Before execution of any piece of code, FSI compiles it and creates a new type in current assembly. This type contain all named variables as properties and named function as function. The latest unnamed variable/function stores in property that called ‘it‘. So, it means that we can collect all required information using reflection. 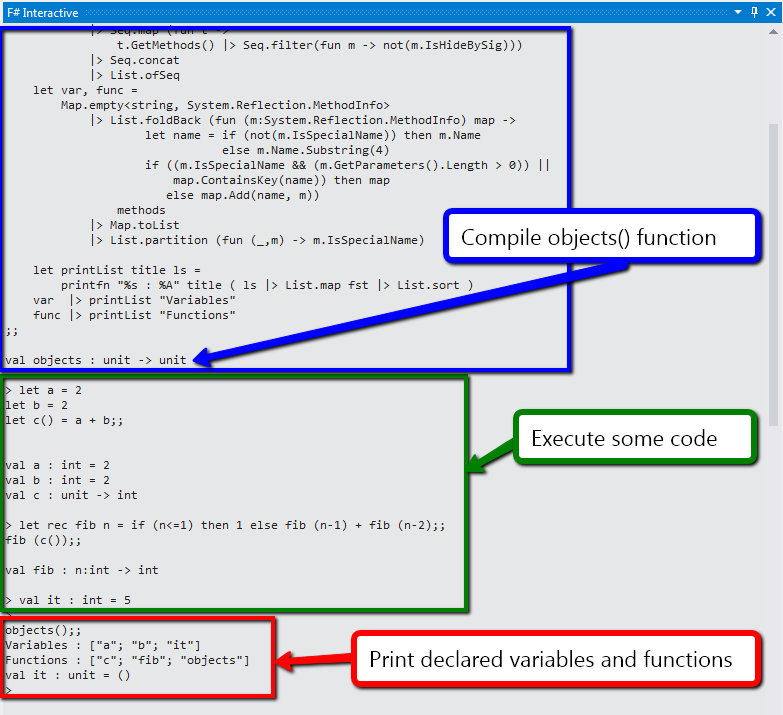 Below you can find my implementation of the function objects() that prints lists of declared variables and functions. Now let’s look at a real-life example on the screenshot below. I have thought about possible directions of FSI development. I have some ideas that I would like to share and discuss. It will be nice to have an ability to save current FSI state into the file and continue work in the next time. It could sound crazy, but it would be cool to save FSI session to assembly and provide an easy C#-F# interaction with such assemblies. For example, it might be useful for Machine Learning tasks. 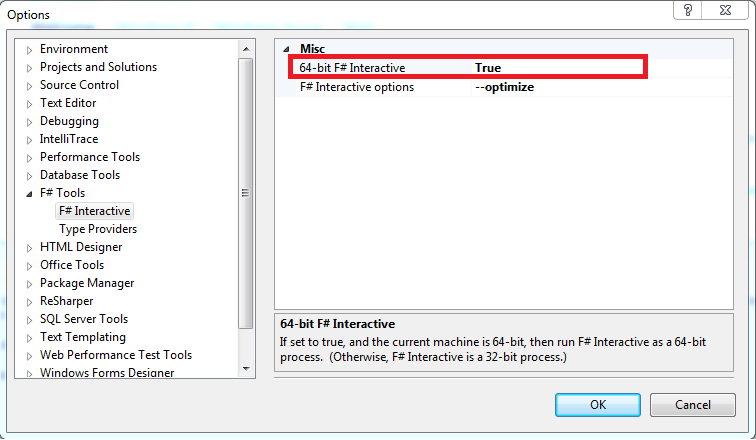 You will be able to create, train and tune your model directly from FSI then save it to assembly and use it from your C# application. There is a tool that provides a part of this functionality. This is FsEye – a visual object tree inspector for the F# Interactive. One of the main cons in type providers is impossibility to explore the schema of the provided world. For example, I want to use Freebase type provider, but I do not know the nature of the provided types. I cannot use provided types fully, because I do not know what data they have. I am pretty much sure that we need to supply a way to explore provided types. This feature for sure should be tightly integrated with F# IDEs (into Object browser for example). All we use MSDN to understand how things work. We copy type name + function name and paste them to Google, find first MSDN link and go there. Why cannot we teach FSI to do it? We just need to build an easy syntax for that. P.S. I will be happy to hear your feedback or new ideas. Feel free to post comments here or to contact me in twitter (@sergey_tihon).